The Things That Matter Most—In Our Jobs and in Our Careers | Work Well. Be Well. But when it comes to our professional lives, it’s not so obvious. Some would say the most important things are our salaries and our job security. If you’re struggling to put food on the table, these truly are important. But if you’re fortunate enough not to be scraping to survive, what matters most to you? Many in this situation focus on career success: promotions, ranks, and raises. In my opinion, career success is over-rated. To me, the most important thing is career satisfaction. Query: Do you derive joy and fulfillment from your job and your career? Do you look forward to your work each day? Or, if you’re a concrete thinker, we can put this another way: Do you love your career at least half as much as a child loves her dog? And, like the dog, does your career love you back? Over the years I’ve had many conversations with colleagues on the subject of job satisfaction and career satisfaction—or the lack thereof. I’ve come to the conclusion that there are four key factors that determine whether you are happy in your job and in your career, or whether you are stressed out (anxious, overwhelmed), burned out (exhausted, depressed), or checked out (disillusioned, bored). Query: Do you have a clear sense of your professional identity? Do you embrace and enjoy that identity? Knowing who you are professionally will anchor you in your career and help you stay grounded and focused. This is crucial in today’s working world where distractions are the norm rather than the exception. It’s all-too-easy to steer off-course, both in terms of daily work habits and in terms of long-term job goals and even longer-term career goals. It’s also crucial for those who are at risk of being promoted away from the jobs they feel called to do and into the jobs that offer higher pay and/or higher status. I’m thinking of the nurse manager who told me she had to retire from her job in order to be rehired somewhere else as “just” a nurse. She said she hated shuffling papers, going to meetings, and solving personnel issues. She just wanted to take care of sick patients. She got off-track because she was a good nurse, so her hospital thought she would be a good nurse manager. I’m not sure if she was a good manager. But I’m sure she was a miserable one. Knowing who you are professionally has an additional benefit: it will help you deal with all the imperfections and inefficiencies, and all the mistakes and mendacities you encounter in the course of your daily grind. If you feel secure in who you are and what you do, you won’t over-react or under-react. You’ll simply change the things you can and not get too bent out of shape over problems beyond your control. If the answer came quickly and naturally, then you are probably engaged, interested, and energized in your job and in your career. If, on the other hand, you squirmed, giggled, hesitated, or cursed, there could be problems. You could be bored, frustrated, or burned out. This may sound patently obvious, but it’s important that our jobs and our careers be interesting. And that’s not easy when you work in a modern office or cubicle and spend most of your time “doing email,” entering data, and going to boring meetings. Believe me, I struggle with this all the time. I want to save the world—or at least leave it better than the way I found it. But instead it seems that all I do is fill out HR forms, take CYA compliance courses, and answer more email. There are at least four things necessary to make a job and a career interesting: intellectual stimulation, emotional connection, meaning, and community. Intellectual stimulation means that the job and the career must evolve, requiring that I learn new knowledge and new skills. Otherwise, the job gets very boring. In my own work I’ve noticed that every seven years or so I get an itch to try something totally new. But even before that I have a need to make smaller changes within my job description. Emotional connection means that I experience my work not only in terms of objective “data points” but also at a subjective and emotional level. On one day I’m happy because we had a good outcome, and on another I’m sad because we didn’t. One day I’m focused and concentrated and just trying to finish a project on time. The next I feel relief, excitement, and joy because we met our goal. I’m proud of my team for what we accomplished, and I’m proud of myself for the role I played in the success. Taking the time to recognize and appreciate these emotions is essential to good occupational mental health. If you’re in a job where you can’t experience these highs and lows, both individually and with your team, you should try to change the culture of your workplace, or start looking for a new job. The other two ingredients that make our work truly interesting are meaning and community . . . If you answered, “Because I make a lot of money” or “Because I work longer hours than anybody else,” you just flunked this exam. You don’t have a clue as to what matters most. My favorite source of inspiration on this topic is Victor Frankl’s book, Man’s Search for Meaning. During his years of interment in the Nazi prison camps, Frankl discovered that those who identified a meaning and purpose for living were the ones who fought hardest for survival. Whether in the most abhorrent wartime conditions, or in peacetime, we humans are purpose-driven creatures. Which is another way of saying that, at our best, we are moral and spiritual beings. Query: In your work life, do you feel like a Lone Ranger, or do you feel that you are an integral part of a team? Do you feel isolated from the people around you, or do you feel connected? It’s one thing to experience career success as an individual, but experiencing it as a team takes it to a whole new level. It’s the difference between being selected “Salesman of the Month” and winning The World Series. I haven’t actually won the World Series myself, but I’m guessing it has most of the benefits of a major individual accomplishment, but the additional satisfaction of combining all those talents into a team that is somehow better than the sum of its parts. It’s the difference between a fine human achievement and something that must seem more like a miracle. But even if you don’t win the World Series, having a positive team experience takes your work-life to a whole new level. First of all, it gives you an opportunity to experience fairness and equality. Those who live charmed lives may be wondering why I even brought this up. But for those who have experienced discrimination or harassment, being a part of a team that values fairness and equality must feel like heaven on earth. Third, good work-teams give each other support. When you’re up against a deadline, they pitch in and help. When you’ve had a bad day, they offer emotional support: a hug, a kind word, or just a listening ear. And when you’ve had a good day, you get a high-five, or maybe you go out for a beer. When it comes to our jobs and our careers, what things matter most? To me, it’s all about identity, engagement, meaning, and community. But that’s just me. And my thoughts are always evolving. I may have a different answer a year from now! What things matter most to you? This is such a fundamental philosophical and religious question, and one that we all need to answer for ourselves. Doing so will give us not only a clear conscience but also a sense of happiness and fulfillment. I encourage you to take some time and mull it over. You’re worth it! And let me know what you come up with. I’m thinking of writing a book about this, and I’d love to learn about different ways people approach this question. I love this photo. 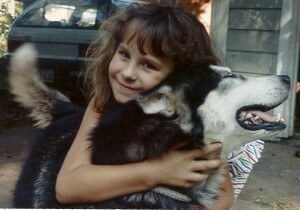 Our dog Mucluc had puppies the same time our daughter was born, and she welcomed Annie to the litter as one of her own. They bonded and were fast friends for the next ten years until Mucluc, like all dogs, went to heaven. So many reads yet no reaction, that’s not fair. Thanks for this comprehensive article, I’m convinced it’s going to help me!